Image courtesy of Ryan Lash / TED. Leave it to the Pope to give a TED Talk that’s uplifting, gentle and confrontational all at once. 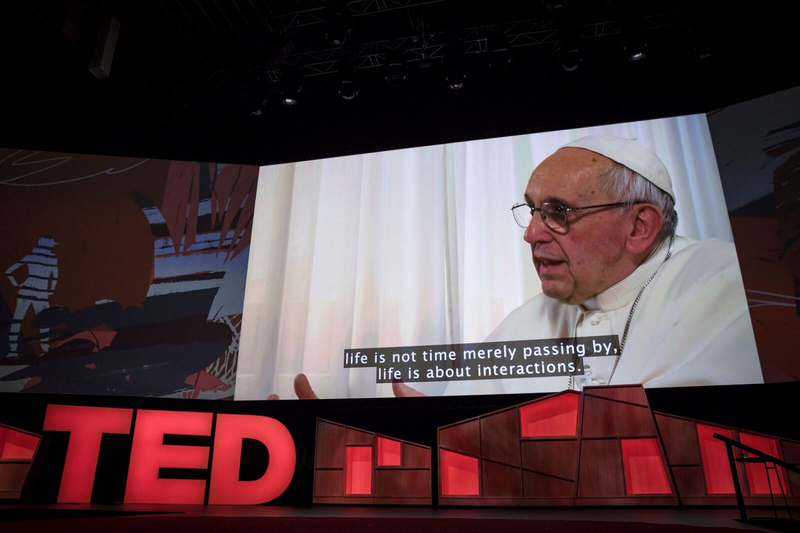 Speaking in Italian to the attendees of this year’s TED Conference in Vancouver, Pope Francis delivered a video message from Vatican City that simultaneously critiqued holders of power and encouraged those who feel powerless — all while emphasizing the strength to be found in our shared humanity. “Feeling hopeful does not mean to be optimistically naïve and ignore the tragedy humanity is facing” socially or environmentally, the pontiff said. Rather, hope is “the virtue of a heart,” he said, and it requires you to not dwell in the past or just get by in the present, but rather open your door to tomorrow — and the messiness and beauty of the world. “A single individual is enough for hope to exist,” he said, “and that individual can be you.” In the Pope’s apparent view, the power of the individual isn’t pure individualism. He was careful to note that nobody is an island, and that no one is independent and isolated from everyone else. Indeed, social science is showing that isolation is one of the worst things for humans, to the point of making us experience worse symptoms when we’re sick. Individual power lies in what Francis calls “tenderness,” or an attitude of care toward others, of love put to action. “I like when I hear parents talk to their babies, adapting to the little child, sharing the same level of communication,” he said. “This is tenderness: being on the same level as the other.” He called for activism in the most personal of senses: caring for your fellow humans. “Tenderness means to use our eyes to see the other, our ears to hear the other, to listen to the children, the poor, those who are afraid of the future,” Francis said. The pontiff criticized how our relationship with technology is warping our way of life and how “techno-economic systems … without even realizing it, are now putting products at their core, instead of people,” a sentiment that dovetails with Time Well Spent, the movement to align technology with humanity. He also asked that scientific and technological innovation be paired with more equality and social inclusion. “How wonderful would it be, while we discover faraway planets, to rediscover the needs of the brothers and sisters orbiting around us,” he said. Whether it’s business, politics or technology, there’s an urgent need to remember that the people around us are not “a statistic or a number,” he said, emphasizing the “tenderness” toward our shared humanity that we all need to cultivate. This isn’t the first time Pope Francis has hit upon themes of interconnectedness — he’s also been vocal on how climate change will hurt the world’s poor more than anyone else. If you really want to care for the people around you, you need to care for the earth, as one houses the other. Watch the video of the TED Talk here and read the transcript here.